Manila, 22 October 2017 - The development and deployment of new technologies to deliver the world’s energy needs from renewable sources are essential if we are to reduce our dependency on fossil fuels. To stop or reverse climate change and to provide the world’s growing human population with the energy it needs, then hydro-, oceanic, wind and solar power must to be part of the mix. But renewable energy is not the silver bullet that will help us overcome the barriers to building a cleaner, better and sustainable future. Regardless of how it is produced, electricity has to be transmitted from where it is generated to the homes, offices, factories, hospitals and schools where it is needed. And this requires a substantial infrastructure of pylons and cables, which leave their mark on the landscape, and, of great concern to those dealing with nature conservation, can have detrimental effects on wildlife habitats and migration routes. September 2017 sees the second meeting of an international task force called into being by the Convention on the Conservation of Migratory Species of Wild Animals (CMS). The Task Force, which first convened in Cape Town last year, brings together a range of key players from governments, development agencies, industry and conservation interests. The goal of the Task Force is to reach out to those decision-makers that are in a position to have real effect on the ground to ensure that renewable energy technologies are deployed in a way that does not harm wildlife, which is already facing unprecedented threats. It would be tragically ironic if the solutions being devised to address climate change, one of the greatest drivers behind what is being termed as the “wildlife crisis”, were to push species already on the brink of extinction over the edge. The developed world is making giant strides in weaning itself off conventional power sources –in Germany on one day in May 45.5 gW of energy were produced from renewable sources, only just falling short of national demand for power (45.8 gW). But there are also downsides – der Spiegel reported in August 2016 that wind farms kill 250,000 bats every year in Germany alone. Controversy rages in the USA over estimates of the number of birds that fall victim to wind turbines, but even if “only” a few hundred individuals of rare, long-lived, slow-breeding species such as eagles fall victim, the effect on the population can be devastating. Such destruction to our wildlife is largely avoidable and even more frustratingly the solutions are relatively simple. Limited modifications to the design of installations, such as the number of turbines and the spacing between them, the height of the blades, their size and the speed at which they rotate can significantly reduce the death toll. Proper consideration of the siting of wind farms in the early stages of the planning process, taking account of wildlife interests can also contribute to results satisfactory to all parties. 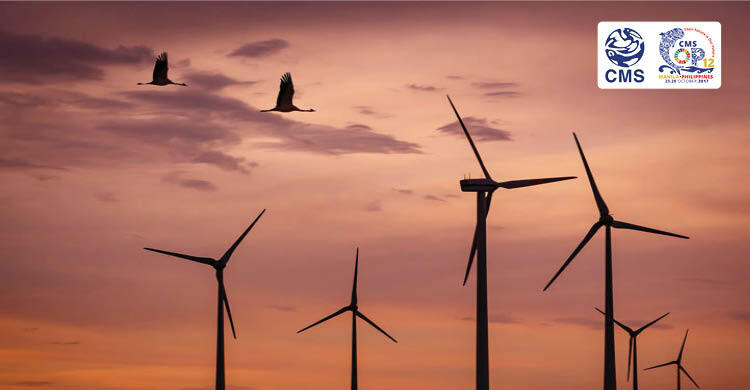 Other solutions include is “shut-off on demand” requiring turbines to be deactivated at the most sensitive times for wildlife – such as the migration season or during periods with low wind speeds, which is when bats are more active. As the turbines are also at their least productive at such times, the amount of potential electricity lost is insignificant. South-East Asia is facing many challenges – its population is projected to rise 16 per cent over the period 2014-2025 – that of the Philippines from 100 million to 119 million. The country aspires to provide comprehensive access to electricity in the next few years while also coping with negative impacts from climate change – predicted to depress GDP across South and South-East Asia by 6 per cent by 2060. Renewable sources are an important element of national energy policy – but are struggling to keep up with demand – in the Philippines the share of hydropower, geothermal and solar, wind and biomass of total energy production fell from over a third in 2006 to a quarter in 2015. Governments at the most recent conference of the Convention on Migratory Species (COP11, Quito, November 2014) adopted guidelines on appropriate deployment of renewable energy; these guidelines complement earlier ones on power lines which seek to reduce the casualties and fatalities among birds from collisions and electrocution, at the same time reducing the disruption to electricity supplies and the costs of repairs and maintenance. After COP12 (Manila, October 2017) the Task Force will continue to work on the principles of openness and inclusion so that solutions can be found that deliver the electricity people need for their everyday lives - not least in South-East Asia - without compromising the survival of already endangered wildlife. Social and economic progress can be delivered without exacerbating the wildlife crisis, and achieving development and preserving the environment are not mutually exclusive. Win-win solutions are definitely within our grasp – this is a case where we can have our cake and eat it.